In the first part of this article, I wrote about the state of Australian building airtightness, and pointed out that codes and the building industry in this country can be compared to the way things were in the US about 20 years ago. Testing is essential to verify that buildings and ductwork are actually being constructed as tight as they should, but there is no mention of testing in the codes. There is also a serious lack of trained personnel, equipment and experience in Australia to carry out that kind of work. Transforming the codes and building practice will require collaboration from many sides of the industry, both public and private. The second half of this article will explore many things that can be done to improve the state of affairs here, in order to get people thinking about how we can work together on this. I will reiterate my earlier suggestion of a target – the 2019 National Construction Code – to influence code officials to include performance testing in the next version, increase awareness in the public, educate and train the building industry, and encourage the building science community in Australia. Later in the article I’ll mention ways to become involved. There are many extremely talented and experienced professionals in the sustainable building industry here in Australia, and they all recognise that reducing air and duct leakage is important. But the truth is there are not still enough people aware of the major opportunity in front of us. Much attention is focused on other techniques and technologies for green building – solar panels, geothermal heat pumps, water recycling and the like – but none of these measures rival air sealing as a durable improvement. Unlike machinery, air sealing doesn’t wear out. There is a definite need to update Australian mentality around air leakage, as we are stuck in the last century. I am disappointed by how often in Australia I’ve heard the old adage, “Buildings need to breathe.” This is not true. People need to breathe, and buildings need to control moisture. We need to replace the old sayings with “build tight and ventilate right”. The Australian Building Codes Board’s own handbook on Condensation in Buildings reinforces this message, and it must be spread. One natural partnership in spreading awareness is with manufacturers of sealants, insulation, air barriers, membranes, flashing, door seals and other weatherisation products. They have the market knowledge and a vested interest in selling products that will help the industry become more energy efficient. As a group, they should be asked to help fund informative case studies and guides for designers, builders and homeowners, with an emphasis on communicating sound building science principals. One major need is the spread of useful information within the building industry, starting with codifying a common language for communication, such as terminology for air barriers, materials and testing techniques and methods of reporting results. This common language will clarify contracts and specifications. Such language is present in other international codes but is missing from the National Construction Code. We can bring about change in the design process by placing performance testing where it belongs: as an essential part of the building commissioning process. Commissioning does not simply mean testing the building when it’s done to make sure it’s working correctly. It is a quality control process that pervades all stages of construction, from pre-design meetings to post-construction analysis and dissemination of lessons learned. To see a good explanation of performance testing as a part of building commissioning, please check out this other post I made. To make real changes in the way Australian buildings are built, we can support interventions in all stages of construction, not just post-construction testing. For example, we could author and publish free consensus-based versions of a model specification for air barriers and envelope testing to be included in project construction documents. The goal is to make it easier for project teams to specify air barriers, sealing and performance testing with language that makes sense based on Australian experience. Model contracts could aid in resolving disputes over testing failures. Short of that, case studies of successful specifications and contracts could help. These documents would be open source and free to maximise their use in the industry. The Air Barrier Association of America offers free versions of some master specifications, an extremely valuable resource for moving the industry forward. Similar resources should be made available to Australians. Model specifications can reduce costs and liability by building on past experience. They can level the playing field for contractors and bidding by making sure that everyone is aware of what is expected at each stage of construction. Many contractors understandably will build extra cushion into their bids when faced with vague requirements. This means that overall, projects specifying performance requirements may end up with higher costs than necessary. Clarity and familiarity will reduce bid prices. We can also help spread information to the benefit of the industry. We can collaborate with academia and other organisations to collate test result data and possibly create a central database for results. Some efforts along these lines already exist. The Green Building Council of Australia requests permission to publish test results of projects seeking extra credits for building tightness tests, for example. These test results should also be placed in an open-source (anonymous if necessary), database that is not the property of any one organisation. Knowledge is only useful if it is shared. Collecting and publishing data on the costs of performance testing will also help the industry and code officials understand what is being proposed. Anonymous surveys are one way to do this. For the residential market, South Australian building science consulting firm Sustainability House did a market survey that showed that costs for standard building leakage tests and reports for detached homes commonly ranged from $400-500, but costs greater than $500 per home were also common. Additional surveys for other types of testing, such as larger commercial building airtightness tests and ductwork testing, would be valuable to the industry. We can help guide public policy by serving as an impartial source of information. The Australian Building Codes Board, for example, will need guidance on how best to sensibly incorporate changes to building regulations over time. Though there will definitely be savings from improving the airtightness of Australian buildings, there will also be costs. These costs include higher design costs, material and labor costs, and costs of inspection and testing. Eventually, if mandatory limits are placed on air leakage there will be cases where failing buildings must make expensive fixes. One need is for gathering and disseminating information about the costs of compliance with any new standards. Codes officials will also need specific guidance on standards and procedures for testing. On 1 September, Standards Australia published AS/NZS ISO 9972:2015, a test protocol for building airtightness testing. However, the standard leaves several open questions about how buildings should be prepared for testing, leaving the decisions to the project team. More clarity is possible and would be helpful. The building science industry in Australia must be nurtured, and it will be strongest if we work together. Instead of separately trying to compete for the same customers, we should make more customers by trying to change the industry at large. Collaboration is key. Sustainability House conducted a survey for the Department of Resources, Energy and Tourism to gauge the competence and strength of the building science community in Australia. 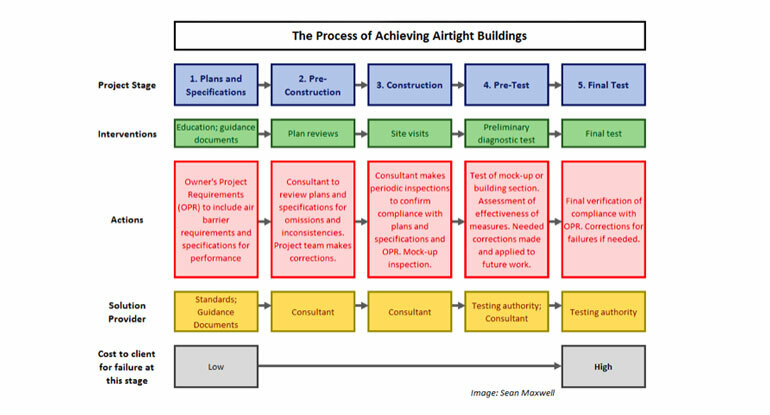 This highly informative study shows that a great deal of development is possible, with a relatively small number of people involved in the building performance testing industry here. There is major potential for growth in this area, and it will be needed should performance testing become mainstream. As for industry networking, connecting with other professionals does not have to mean expensive cocktail parties. Many events are so ridiculously expensive that many would-be participants are discouraged from attending. Meetings can happen over the web, at a pub or in a public library. For example, Home Energy Pros, a government-sponsored online community in the US, which is open to Australians, offers a free place to connect with other building science professionals and share knowledge and insights. LinkedIn can provide a similar platform for exchange, as described below. Many training efforts already exist in Australia, but performance testing is one area where current efforts can be expanded. In the UK, the Air Tightness Testing and Measurement Association (ATTMA) serves as an accreditation authority for testing professionals. In the US, the Building Performance Institute and the Residential Energy Services Network both train and certify professionals. Accreditation is generally a good idea, though there should be different levels for large and small-scale construction. Testing large buildings is significantly more equipment and labor-intensive. One organisation already committed to this is the Air Infiltration and Ventilation Association of Australia, or AIVAA, among whose stated purposes are “to promote the use of performance-based criteria and measurement in the calculations of energy efficiency rating schemes and other regulatory building requirements” and “to introduce scientifically based ‘accredited’ training, certification and registration”. Though this organisation has not been very active over the past few years, its resurgence could allow it to perform these important duties for the Australia building performance industry. AIVAA or another organisation could also guide policy regarding the calibration of equipment – almost all testing equipment is manufactured outside Australia so standards must be written with this reality in mind. While many Australian projects have referred to ATTMA standards, these cite UK calibration requirements, which don’t make sense. We should also advocate for enhanced training for those already involved in home energy assessment. NatHERS assessors are already trained in software techniques, but like the Home Energy Rating System raters in the US, a network can be trained and certified to perform on-site inspections and testing, building on the same network of interested professionals. An organisation with the same expertise and training goals is sorely needed in Australia. It may be that existing organisations can fulfil the purposes necessary to bring the airtightness of Australian buildings in line with the rest of the world. Or, it may be necessary to create new organisations. In any event, we must all begin a period of collaboration if we are to truly influence the direction of building in this country. As a first step, we must bolster organisations that foster improvement of the airtightness of Australian buildings, or establish new ones. As an example of the kind of collaboration needed, a group of experts came together to address the shortcomings of the proposed 2016 Section J, the energy efficiency provisions of Australia’s National Construction Code. The group they founded, the work they did and the information they provided to the Australian Building Codes Board are inspirational. They showed what a concerned group of experts can do when faced with an immediate challenge. Their website provides helpful information and links, and it also invites you to connect with their group. This is the kind of work that needs to be done to truly address the unfortunate leakiness of many new Australian buildings. 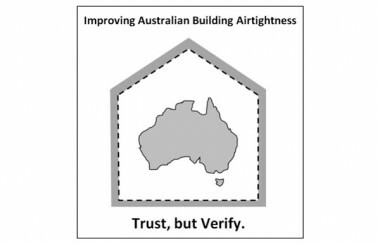 I invite you to join the newly formed LinkedIn Group, “Improving Australian Building Airtightness,” which I created to help pull together experts who think that Australia buildings can and must be built more airtight. The goal of the group is to organise, exchange information and increase cross-industry connections. Sean Maxwell is an ASHRAE-certified commissioning process management professional living in Sydney, Australia. 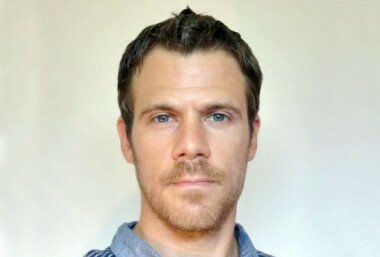 He has 10 years of experience in building performance testing, commissioning, and research. Would you please provide more info on AIVAA as I cannot find anything on this association. I was excited to learn of AIVAA’s existence but not thrilled to see that it has been rather inactive for a few years. They don’t have a website currently, and no, they’re not related to AIVC. I have become a member of AIVAA and hope to greatly increase its visibility and influence by gathering others under its umbrella. There is supposedly a meeting coming up on November 10 in Melbourne which I believe will be open to the public. Please message me on LinkedIn if you would like more information and I will pass it on when I learn it. Thanks. Great article, thank you! Unfortunately not only the older homes but also new builds often have huge air leakages, especially windows and doors. We try to educate the public as well as building professionals that it is important to look at air infiltration on WERS tested windows and doors, e.g. http://werscpd.net.barberry.arvixe.com/browse.aspx It is easy to understand that draft is the enemy of energy savings. While air leakage is an important part of energy efficient building design it is only 1 part and the level of importance is proportional to the climate zone. Contribution of passive solar gain, thermal mass, insulation and occupant behaviour are also critical and any discussion about air leakage without an understanding of the impact of the myriad other attributes is clearly not painting the full picture. For instance, air leakage in a lightweight structure without good passive gain in a cool climate will cause more detrimental effect than in a house with good passive gain and appropriate thermal mass and an occupant who is conversant with when it is best to open or close windows and blinds. Any notion that air leakage is the prime issue for improved energy efficiency, at the exclusion of others, needs to be looked at with a level of concern. A common reason why air tight buildings have caused issues in Australia is a failure to properly design the building ventilation. Historical minimum building code requirements of 5% floor area or 10 L/s.person outdoor air, and exhaust systems with no real make-up air pathway, have worked for buildings that are historically leaky. For the air tight building however nothing can be assumed. Generous outdoor air flow ventilation with heat recovery and filtration, combined with increased exhaust in wet areas and occupant/user control capabilities should be provided for the air tight building, even the building with openable/sealable windows. A common reason why HVAC represents such a significant energy use in commercial and residential buildings is of course a lack of building air tightness. The cooling/heating load estimate will generally incorporate a rule of thumb guesstimate to account for air infiltration, often without making reference to the actual construction characteristics of the structure. The leakier the building is, the harder and longer the HVAC system has to work. The leakier the building is the less likely the HVAC system will be able to maintain comfort indoors on very hot and cold days. The benefits of building sealing when combined with proper ventilation are large. The costs are not that great but the changes required in behaviour and practices are challenging. Great to see you mention the adage “build tight, vent right”… Not good that you then ignored it for the rest of the article. Yes, we need higher air-tightness standards but they MUST go hand in hand with improved ventilation standards and enforcement. Heat Recovery and Energy Recovery Ventilation should also be mandatory. We should also outlaw practices like pulling air out of attics and calling it heat Recovery Ventilation. Andy, I agree with you that ventilation must be improved at the same time that building tightness is improved. In the U.S., standards like ASHRAE 62 take building tightness into account for the amount of ventilation required. Leaky buildings do not need supplemental ventilation but tight buildings do. The good thing about performance testing is that you can be more confident that your ventilation and heating/cooling design will work as intended when you can be sure that you are achieving a target level of building tightness. Currently there is quite a bit of oversizing of HVAC equipment because the quality of the envelope is such an unknown. As for heat/energy recovery, I think it is most cost-effective in highly insulated and extremely tight buildings and we have not made that much progress to start requiring it by code. Can you inform me of the relevant sections of the NCC regarding ventilation? I will have to look into this more. Your description of pulling attic air into the house sounds scary. 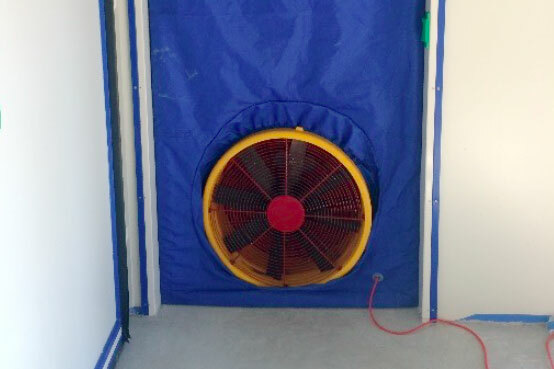 In the U.S., a common solution to code-required ventilation in heating climates is a high-efficiency exhaust fan in the toilet that runs at a constant, low level. Many of them also have a boost mode when the toilet is in use. Panasonic WhisperGreen series is very common in Energy Star homes. Perhaps a similar, low-cost solution would be a bridge to higher-efficiency solutions like heat recovery 10 years down the line. Thanks for your comments, and I hope we can trade ideas soon in one of the above mentioned forums. Please do shoot me a message if you can locate the residential code requirements for ventilation. Thanks.